on to it as it churned up the thick clay that is common in the Willamette Valley. The girls had measured out the 5‘x11’ plots with sticks and I did my best to stay within the boundaries with the bucking machine. It didn’t take long to churn up the area of the three plots. for our garden. We picked out one at about 25$ a square yard and I told the guy he could put 75$ worth in my truck for us to take. Laughing, he said I would only fit one. He was right! When the backhoe came and dumped the first load into the back of my truck it overflowed off the sides and piled up almost to the height of my cab dropping my truck about 6” on the suspension! We quickly realized that we needed a wheelbarrow to move the soil from the truck to the backyard so we picked up a cheap one at Bymart where Alexa had to buy a 5$ membership with me as the spouse so Emily and I could use the other card for our membership. and dropped into the clayey ground. We nailed the corners together with wooden blocks to make it all very secure. The rest of the afternoon was spent getting two more truck loads of dirt with my truck and one with Kevin’s when he returned home with his mom who was amazed at what we were creating. 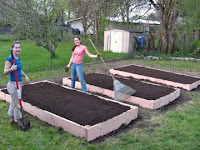 Just before dark we had built all three beds and buried within them about 8-10” of rich compost infused soil. The next morning we got up and made one more trip back to The Bark Place to pick up red wood chips to surround our plots and make them look professional. We spent the rest of the beautiful afternoon gardening and pruning flowers out front and in the back. We realized that we really do have an amazing yard with tons of flowers that were once hidden behind weeds as well as an apple and pear tree in the backyard and Himalayan Blackberry bushes in the backyard. That evening we all invited friends to come over and Kristen, Peter, Jason and Hartz stopped by with their dogs for some BBQ action. Everyone really seemed to be impressed by the work we had put in over the two days. Although Emily and I didn’t go anywhere special for the weekend I think we both felt a great feeling of accomplishment when we looked out our window at the beautiful raised beds we had just built.